Dear Geoff and the Ambassador Band, YOU GUYS WERE SOOOO GOOD. Thank you all for your energy, flexibility, music, rhythm, love and professionalism. We hope you enjoyed the night too. We’re only planning on doing this wedding thing once, so will have to recommend you to our friends so that we can hear you play again!!! Please pass this on to the whole crew – musicians and sound/lighting team. We used Ambassador band for our corporate Christmas party (housing association based in the Midlands) and they were worth every penny. Everyone was up dancing before the alcohol could kick in due to the variety and upbeat nature of the performance and they were the main reason everyone enjoyed the night. Very professional to work with and I would highly recommend Ambassador for any function or event. 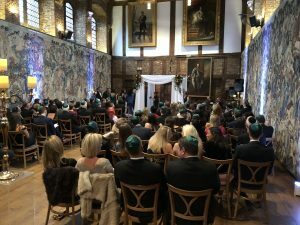 On 14th October 2018 Ambassador Band were booked to perform at the Jewish wedding of Paula and Ben, at the very beautiful Hatfield House in Hertfordshire. This venue is amazing and has a large banqueting hall where the ceremony, dinner and evening party takes place. 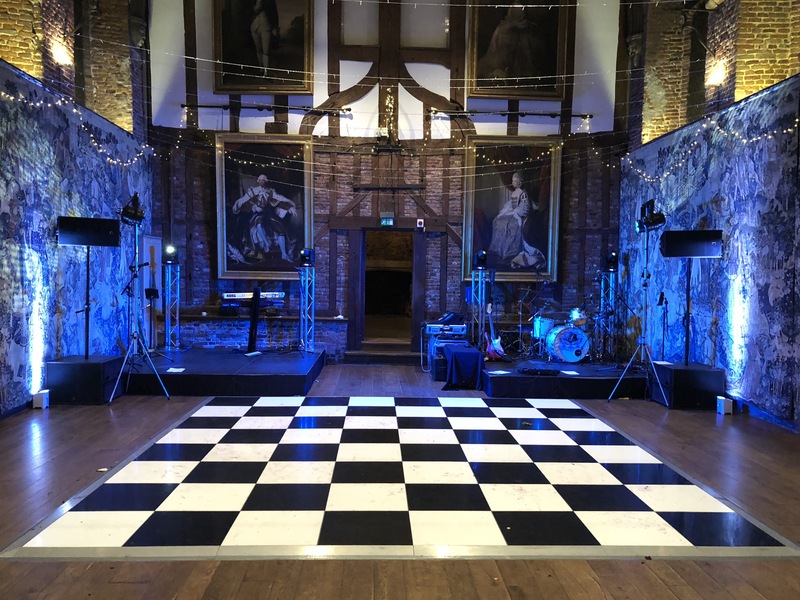 The venue once belonged to Queen Elizabeth I and boasts many original featured including brickwork and paintings. Both Paula and Ben and their families were a delight to work with and such lovely people. Both sets of parents personally came to see us after we had performed and thanked us for “a truly outstanding performance”. In the lead up to the wedding Paula was our main point of contact and knew exactly what she wanted both visually and musically from the outset. Once she had gave us her brief, we were trusted and left to get on with it – and we delivered as always. Beyond the evening entertainment we were also asked to provide music in the Chuppah ceremony and the drinks reception. Our specialists Yair and Stephen took charge of this and made sure everything was perfect in these area. The duo was made up of keyboards and clarinet with Yair also singing the Jewish sections in Hebrew. They performed as guests arrive for the ceremony, entrance music for the bride and entrance music for the groom. Music while signing the register and then Simcha (celebration music) for the smashing of the glass and as the bride, groom and guests departed for the drinks reception. For our live repertoire selection we asked Paula and Ben to send us a list of their favourite songs and we built the set list from there. Their first dance was You’re my best Friend by Queen and we arranged this to include a brass line. 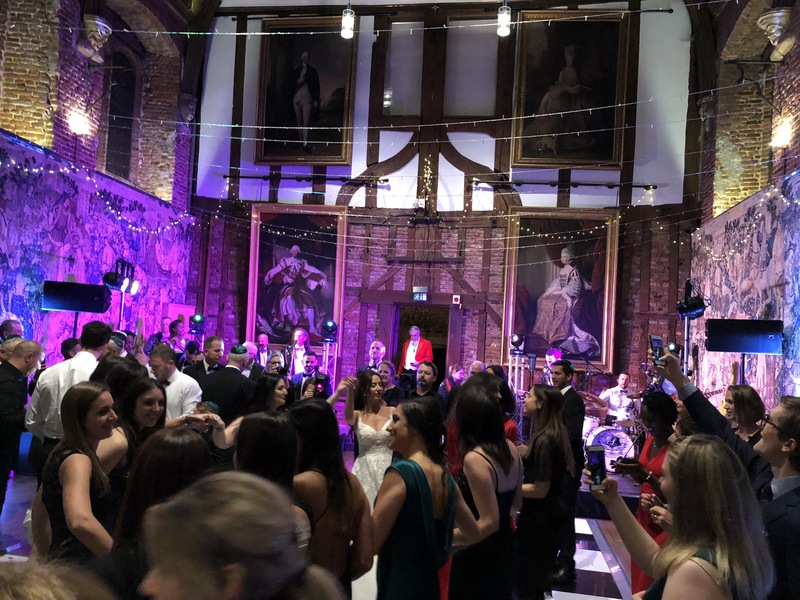 It was indeed and amazing first dance choice and set list and had the dance floor bouncing from the minute we started performing until the last note we played at the end of the evening. Ambassador Band are absolutely outstanding artists who not only elevate the spirit of the party but put a “REMEMBER” stamp in the impressions of each and every guest.Last week I had my 50th b-day party and inviting these guys to play was the super-party guarantee that was completely fulfilled. They are just fantastic magicians who mesmerize the audience with their music and show, no exaggeration. Many thanks from Skopje. So many thanks for helping to make this such an amazing and special evening for us. Your vibe was spot on and the sound was brilliant – just what we wanted. We loved it! There were so many muso friends in our wedding party and so many of them said that this was the best function band they had ever heard! Please pass onto all of the band members. Having seen the Ambassador band play at a friend’s wedding a couple of years ago, we knew we just HAD to have them to play at ours! And they were just brilliant! Such an amazing repertoire, the Ambassador Band bring amazing energy to the stage and create the most awesome party vibe. The dance floor was rammed from start to finish! So many comments from our guests about how good the band were, many saying they were the best wedding band they’d ever seen. Geoff was a pleasure to deal with in organising everything and they even learned our favourite song, Lost in Music which went down a storm for our first dance. Thank you to all the band for bringing everything and creating the perfect party atmosphere! You guys absolutely rocked it! 11 of out 10. Highly recommended!! No hesitation in recommending this amazing band, they are AMAZING!! Thanks so much guys! Ambassador Band performed at our wedding September 2018. The process of booking them was incredibly smooth and they communicated brilliantly with us before the day. They let us have input in the set list and were incredibly flexible. They did a stunning Israeli dancing set, as well as their usual fabulous stuff. They really know how to get people up on the dance floor and moving, they are so incredibly tight as a band and each member is outstanding in their own right. Their singers got on the floor with us and really got involved with the guests. They were professional, fun and lively throughout and I’d recommend them for any event you’re planning!